This is beautiful. Love the "creek." You have both fire and .. This is beautiful. Love the "creek." You have both fire and water. It would be like camping in your own backyard. Sitting outside in an outdoor nook. 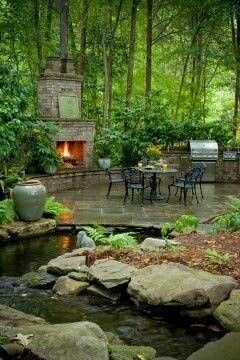 How to create a relaxing outdoor space. Alfresco - sharing a meal under an open sky.